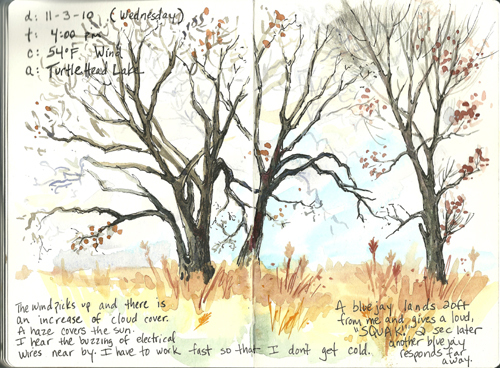 Trees of Turtlehead Sketch – Let's Paint Nature! I find a group of trees along the orange trail that holds my attention, I make myself comfortable and sit right down. The sun at my back is starting to fade as a thin layer of clouds arrive bringing with it a stronger wind. I must sketch quickly before my light jacket fails to provide warmth. The electrical wires to my right are giving off a loud buzzing noise. Not annoying, just different. A blue jay lands 20 feet from me on a branch. He immediately lets out a loud, “SQUAWK!” A second blue jay from across the field quickly answers. He looks in that direction but doesn’t move. He starts to wipe his beak off using both sides of the branch in a quick motion. Did he just have a snack? Here is what I was looking at. 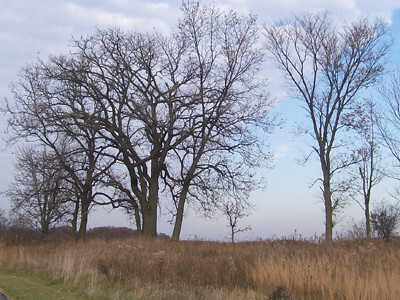 I like the oak trees to the left, they have beautiful gnarly twigs and the grasses in front are a brilliant amber color. I was out for an hour and a half before the wind got to me. I finished the sketch at home using a black micron pen. Maybe you would like to make a quick sketch of nature too? ← We’re Going Video Baby! I liked the way you described the process of sketching, including the blue jay who distracted you. The sketch is lovely! Joan: Thanks! Everytime something like that happens, I think, holy cow I’m so lucky! I love this sketch…Absolutely wonderful!